Light from distant quasars (red dots at left) is partially absorbed as it passes through clouds of hydrogen gas. Astronomers working on the BOSS survey used this effect to study the history of dark energy in the universe's ancient past. Extremely bright black holes gobbling up matter in the distant universe have provided a window back in time for astronomers to study dark energy more than 10 billion years ago. Dark energy is the mysterious force thought to be pulling everything in the universe apart, causing space-time to expand and galaxies to move farther and farther away from each other, all at an accelerating clip. Dark energy, whatever it is, currently appears to be beating out the attractive of force of gravity that works to pull galaxies and everything in the universe closer together. However, that wasn't always the case. When the universe was young, astronomers think dark energy's impact was small, and gravity won out. Now, researchers report observations of the early universe from the Baryon Oscillation Spectroscopic Survey (BOSS), which studied thousands of distant objects called quasars to map out the universe up to 11.5 billion years ago. Quasars are active black holes that release copious amounts of light as they gorge on matter. "No technique for dark energy research has been able to probe this ancient era before, a time when matter was still dense enough for gravity to slow the expansion of the universe, and the influence of dark energy hadn't yet been felt," BOSS principal investigator David Schlegel, an astrophysicist at the Lawrence Berkeley National Laboratory in California, said in a statement. "In our own time, expansion is accelerating because the universe is dominated by dark energy. How dark energy effected the transition from deceleration to acceleration is one of the most challenging questions in cosmology." The BOSS scientists used the Sloan Foundation Telescope at the Apache Point Observatory in New Mexico to observe more than 48,000 far-away quasars. The measurements were what are called spectra, which break light up into its constituent wavelengths. 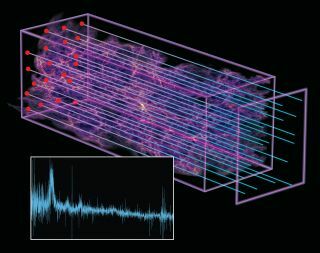 In this case, the spectra revealed key information about clouds of gas that the quasars' light traveled through on its journey from them to the telescope. By studying the distribution of gas throughout the universe, the scientists pieced together a large-scale map of how matter is spread out in space. This spread reveals variations — called baryon acoustic oscillations — that arose soon after the universe was born and which provide a cosmic ruler to measure how quickly the universe was expanding at various stages in the past. "We are seeing back to the matter-dominated universe, when expansion was decelerating and dark energy was hard to see," said Berkeley astrophysicist Martin White. "The transition from decelerating expansion to accelerating expansion was a sharp one, and now we live in a universe dominated by dark energy. The biggest puzzle in cosmology is, why now?" The mapping technique using quasar spectra has never been done before, and represents a technological breakthrough, the researchers said. "When I presented this idea to a conference of cosmologists in 2003, they thought it was crazy," White said. "Nine years later, BOSS has shown that it's an amazingly powerful technique. It has succeeded beyond our wildest dreams."